25 Need-to-Know MBA Models provides easy access to the most useful models, tools and concepts that are covered on MBA programmes. Whether you are a student about to embark on an MBA or a manager who wants to understand the ideas taught, this guide will help you to get ahead. 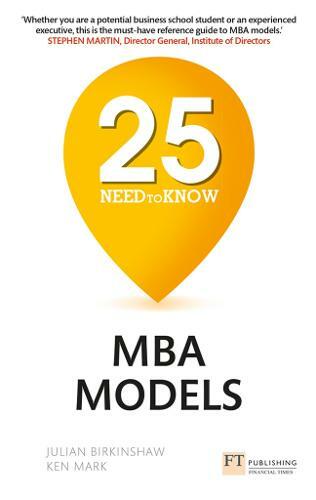 Covering 25 key models that have been picked from programmes around the world, 25 Need-to-Know MBA Models cuts through the jargon to give you the core information on each model: what it is, when to use it, how to use it with key practical tips. With indispensable models that will help you make the most out of every business opportunity, this book tells you what you need to know, fast. "Whether you are a potential business school student or an experienced executive this is the must-have reference guide to MBA models"
"This book is an essential tool for anyone working in management today." "Whether you are a potential business school student or an experienced executive this is the must-have reference guide to MBA models. I wish this book had been around when I did my MBA! At last, the definitive reference guide to MBA models packed full of useful tips and practical suggestions." "This book is an essential tool for anyone working in management today. It explains in clear terms the important management models and techniques that are widely used, and what Management need to do next if they want to learn more." "Captures brilliantly the key ways businesses think and act in an easy-to-read book. Complex business frameworks made easy to understand, with helpful tips and guidance."